What do you consider as self-service? 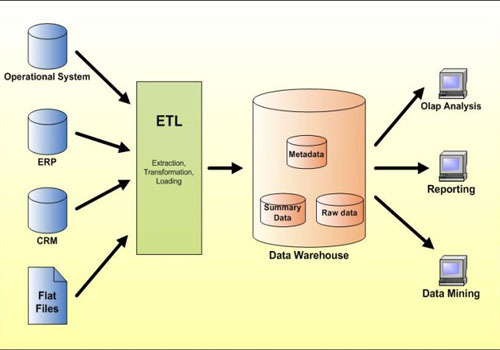 What is data warehousing? In the world of business intelligence, a data warehouse (DW or DWH) is the term used to describe a storage centre, or database, which is used strictly in regards to reporting and analytical purposes. A data warehouse is a compilation of data deposited from various sources, from operational systems such as marketing or sales, into a central location. The function of the warehouse is primarily to store data used for supporting managerial level business decisions. This warehouse would be regularly maintained and managed by a data warehouse developer. Data warehousing warrants a developer to keep everything flowing properly. What is a data warehouse developer? This is a person, or team, who is responsible for the development of the operational systems from which data is ultimately extracted for future reference. This extraction load is called an ETL (extract transform load). Dave Henschen, the executive editor of InformationWeek, released InformationWeek’s 2014 Analytics, BI, and Information Management Surveyin Q4, 2013 to preview how organizations expect to capture, analyze, report, and act on their data. The utilization of business intelligence plays a significant role in all four of these aspects. The main takeaway from the study shows the trend towards less complex and more visual analytics. 2013 was a big year for analytics and Business Intelligence (BI) products as 35 percent of survey respondents have standardized at least one analytic or BI product throughout their company. This is up from just 30 percent of organizations going into 2013. Clearly organizations are finding value in Business Intelligence tools as 97% of responding organizations deploy analytics and BI in some capacity. Applying Agile Methods to Data Warehouse Projects by Jim Gallo – BeyeNETWORK. Roles and Responsibilities in Business Intelligence Teams, Part 1 by Maureen Clarry – BeyeNETWORK. Wow, I found the statement below, from Magic Quadrant for Business Intelligence and Analytics Platforms, very interesting. I have found that having the best of both worlds; ease of use/availability for business users and the ability to maintain enterprise wide governance has been an issue. It will be interesting to see what products emerge that can provide for both. business users’ requirements for ease of use and enterprises’ IT-driven requirements. Magic Quadrant for Business Intelligence and Analytics Platforms.